At this point, you’ve read about my first two horses (Logan and Robin), and about where I got my horsey foundation taking lessons. This chapter is about a different barn where the emphasis was more on training. It was really a huge springboard for where I am with horses today. I don’t remember exactly when we returned Logan to his previous owners, but I think it was in 2005. I started Robin under saddle as a 2 year old while boarding her at the “lesson barn” and working for my instructor in exchange for her assistance in training. This wasn’t a particularly successful arrangement. I was one of the oldest/most experienced students working at the barn at that point, so it was more efficient for my instructor to have me do something than a younger student. Unfortunately, this limited my time to work with Robin as she needed. We had countless round pen sessions, but I seldom had enough time to ride her after working with her in the round pen, and it wasn’t advisable to skip the round pen sessions and ride immediately. So when I did have time to ride after working on bitting, etc. she felt rushed, because I felt rushed. Robin quickly developed a rearing habit, which was terrifying for me. Obviously I wasn’t the only one who was terrified, because my instructor asked me not to ride Robin when she had other students in the barn. Since that basically eliminated my time to work with Robin, we brought her home to our barn and I stopped working with her. My confidence was badly shaken, and I didn’t know where to go from there. A girl that I took lessons with had a cousin who was a horse trainer, and she’d started working with him. After talking to her about my issues, she talked to her cousin, who was willing to work with Robin. I begged my Dad to pay for a month of training for Robin with a professional to hopefully eliminate the rearing habit she’d picked up. He eventually agreed, and we hauled Robin about 15 minutes from home to the new barn. Robin was 4 now, and I was 17. I’d been working a part time job in the same area for a year, so it was easy to go over before or after work to see how she was progressing. Once her month was up, I started working at that barn, cleaning stalls, etc. in order to pay for field board for her to stay there so that I could take lessons on her. My confidence was still shot. I took Robin to 4H camp in the Fall, and she did well considering her maturity and her training level. I’ll write a post on 4H later though. By winter, I was working on college applications, and my parents were hoping I would attend the local community college in town. I applied to, and got into, a nearby private school, but my parents were much more interested in my attending a school near home. So they bribed me with a horse. If I would attend the community college, I could have a new horse. I had been feeling left out for a while because all of my new friends at the new barn rode and showed Appaloosas. Robin was a Paint, so she wasn’t eligible to go to these shows. I’d been using going away to college as justification for not owning an Appaloosa and going to shows, but this option changed things. Lil Man was in training at the barn to be sold, and coincidentally was an Appaloosa. I rode him a few times in the barn, but didn’t think my parents would go for it. He wasn’t cheap (compared to the horses we’d already bought…keep in mind that Logan was free and Robin was $400) at $1500. I guess it still beat paying for private school tuition, because he was my Christmas present in 2006. Ironically, he and I never made it to a single Appaloosa show. I’ll elaborate more on his quirks in my next post. 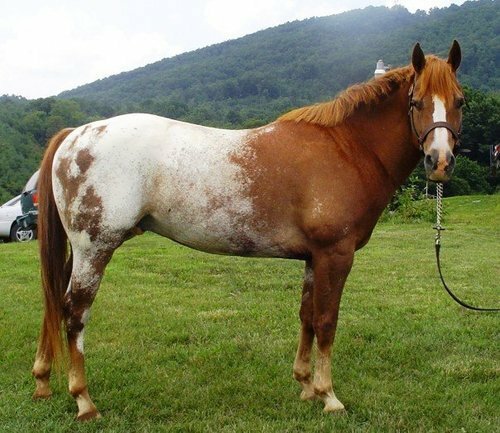 After owning Lil Man for a while with no progress, I’d saved enough money of my own to buy another Appaloosa. We went to North Carolina to pick up a baby that the trainer had bought and I found one that I was interested in. I brought Keychain home that day with the trainer’s colt (despite not having enough money to purchase him). The owners told me that if my parents determined that I’d made a bad decision and got mad at me, I could return him. Within a few days, we realized that he wasn’t particularly fond of people. During one of my shifts at work he kicked my trainer’s wife, my friend, and narrowly missed when he kicked at my trainer. What was so infuriating that caused him to kick so much? They were trying to brush him. We decided that meant he probably wouldn’t be much fun for me, so we took them up on that return policy. Keychain, so cute, but so evil. After returning Keychain, I was on the horse hunt again. I emailed some people in Ohio about a filly they had for sale because they were planning on coming to a show that we were going to in WV. In theory they could’ve brought her to the show and she could’ve come home with us. That wasn’t mean to be either it seemed. In hindsight, I don’t blame them for not taking me seriously, I was still very young. The next barn we went to was towards Tennessee. We went and looked at their babies. They showed me two fillies they were fitting on for halter and another who they weren’t fitting on, and a colt who wasn’t getting fit on either. The two fillies in work were way out of my price range, so they were eliminated immediately. 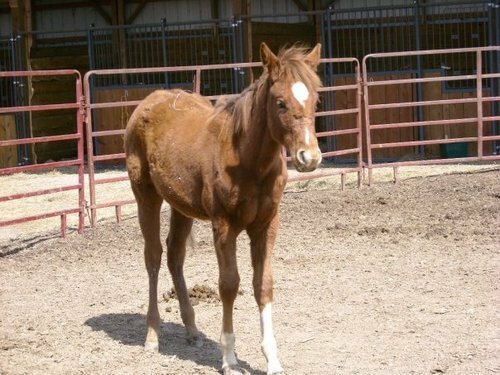 The other filly was Robin’s long lost Appaloosa twin-chestnut with four socks and a blaze, and while I found that endearing, I already had one mare that looked like that, so I chose the colt. Copper (then named Levi) was delivered a couple of weeks later in March of 2008. Seven years later, he’s still with me. Baby Copper the day he was delivered. 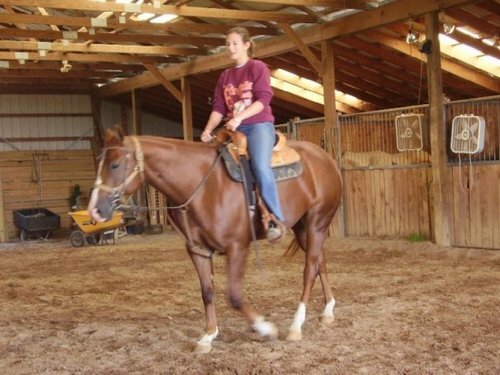 I brought Copper home over the winter briefly that year, then brought him back to start him under saddle, but he was too small and wasn’t strong enough to start yet. So I brought him back home and let him grow up some, and since then he’s lived at my barn, only leaving a couple of times for training.